The provincial government is paving the way for liquid natural gas projects in B.C. after Premier John Horgan announced on Thursday that tax breaks will be made available for a potential $40 billion LNG terminal in Kitimat. Mayor of Kitimat Phil Germuth said he's pleased about the announcement because of what it could mean for businesses and the economy in his district. "We are extremely happy," Germuth said. "It's huge for us. It's a great project and, of course, it's employment." The project is expected to employ as many as 10,000 people by 2021. Finance and energy ministries estimate the project could generate $22 billion in direct government revenue over the next 40 years. The government is offering the industry a break on the carbon tax, a provincial sales tax exemption and an end to an income tax surcharge brought in by the B.C. Liberals. "I don't look at these as tax breaks, I look at them as being able to have LNG Canada on a level playing field with the rest of the world," Germuth told Stephen Quinn, host of CBC's The Early Edition. Kathryn Harrison, a political scientist at the University of British Columbia, said the NDP's announcement is surprising but not unexpected. "All governments like to entice big investment and create lots of jobs. The NDP is no different in that respect despite what they might have said in opposition to the Liberals," she said. 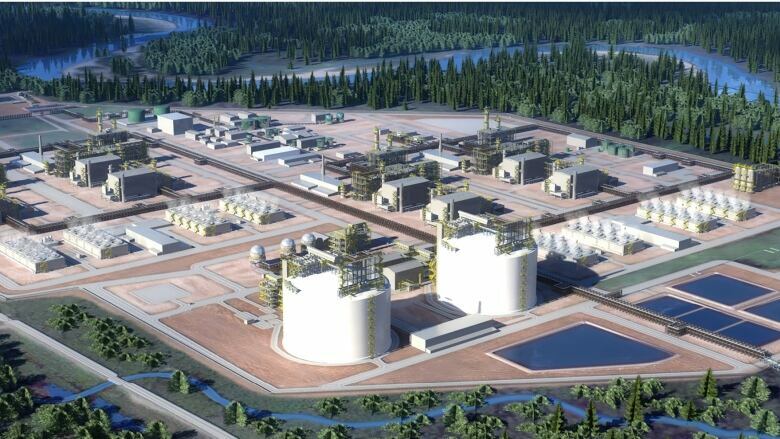 Australian LNG company pulls out of project near Prince Rupert, B.C. They may also be sensitive to not wanting to be depicted as the party that opposes all development, she added. "Why I am surprised is that this announcement seems to be contrary to some of their environmental commitments," Harrison said. "And also [puts] the fate of their government, in particular their confidence and supply agreement with the Green Party, at risk." Ellis Ross, the official opposition critic for natural gas and petroleum resources and the Liberal MLA for Skeena, has been working on LNG initiatives for more than a decade. He is the former Minister of Natural Gas Development. "Basically [the NDP] have been repeating what the Liberals are saying for the last five or six years," he said. "In fact, they went beyond it." The announcement is a deliberate message to the B.C. public, he said. "They need to show the people of British Columbia that they are not totally opposed to these kinds of development," he said. "They need one project to prove it and LNG is a low-hanging fruit." He said the NDP will now have to deal with the activism against LNG that the B.C. Liberals faced for many years. It was not too long ago that the NDP themselves were in that camp, he pointed out, with opposition to projects like Pacific Northwest LNG, which was indefinitely delayed in 2016. "They will still have to deal with the activism," Ross said.